By 2050, global water demand is projected to increase by 55 percent. Here in Colorado, we face a shortfall of more than a half-million acre feet in water because of our growing population. How can we address our challenges locally and beyond? Globally, 660 million people lack access to clean water and 3,000 children die every day from water scarcity. 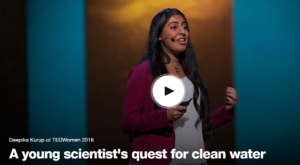 Deepika Kurup, a young water innovator, has been determined to solve the global water crisis since she was 14 years old, after she saw kids outside her grandparents’ house in India drinking water that looked too dirty even to touch. See how her science fair project turned into a solution for clean water around the world. As the world’s population continues to grow and climate change effects our environment, we’ll have to feed more people using less available land. 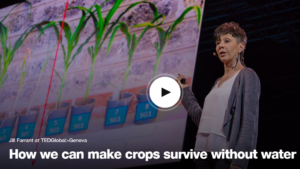 Molecular biologist Jill Farrant discusses a rare phenomenon that may solve our agricultural shortages – resurrection plants. Resurrection plants can lose 95 percent of their water and remain in a dry, dead-like state for months to years, but with a touch of water they can come alive again. As the world’s climate patterns continue to shift unpredictably, places where drinking water was once abundant may soon be depleted. 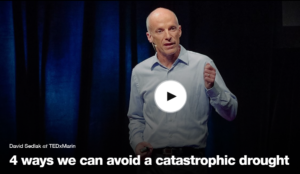 Civil and Environmental Engineer David Sedlak shares four practical solutions to the ongoing urban water crisis in this TED Talk on the ongoing urban water crisis. Watch Sedalk elaborate on his four solutions: stormwater harvesting, water reuse, water conservation and seawater desalination. Imagine a country with abundant power – oil and gas, sunshine, wind (and money) – but missing one key essential for life: water. Qatar went from a country having no water to a country consuming water at the highest degree of any other nation (430 liters per capita each year). 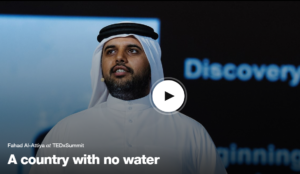 Infrastructure engineer Fahad Al-Attiya talks about the unexpected ways that the small Middle Eastern nation of Qatar creates its water supply. Laura James is the marketing and communications coordinator for the Denver Metro Chamber.